This summer saw the opening of what is only the second major off-price chain in Europe. Hudson’s Bay Company brought its Saks Off 5th off-price format to Europe in June, with the opening of its inaugural store in Düsseldorf. It joined TJX Companies, which trades as TK Maxx in Europe and has stores in the UK, Ireland, Germany, Poland, Austria and the Netherlands. TK Maxx has so far been the only off-price brick-and-mortar chain of note in Europe, although we view Amazon as a de facto off-price fashion retailer, too. The immaturity of the off-price channel in Europe suggests opportunities for growth. TJX Companies has stated that it aims to operate 1,100 stores in Europe and Australia over the long term, of which 125 would be in Australia, implying 975 stores in Europe. As of January 2017, the company operated a total of 582 stores across these regions. 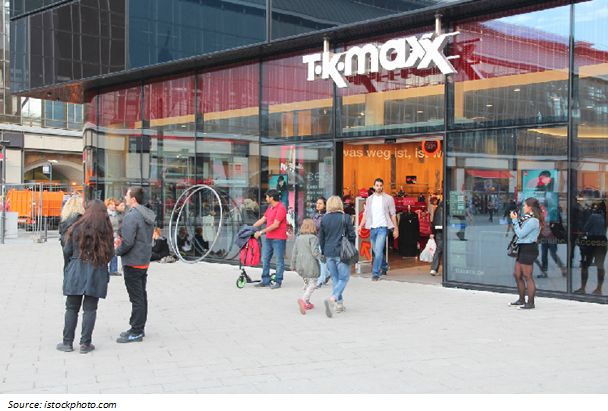 The company plans to open 45 more European TK Maxx stores by January 2018, the end of its current fiscal year. Saks Off 5th already has five German stores and one Dutch store, according to its website. A second store in the Netherlands will open in autumn 2017, the company says. Data from Euromonitor International show that the off-price sector accounted for only 2% of European apparel specialist retail sales last year. 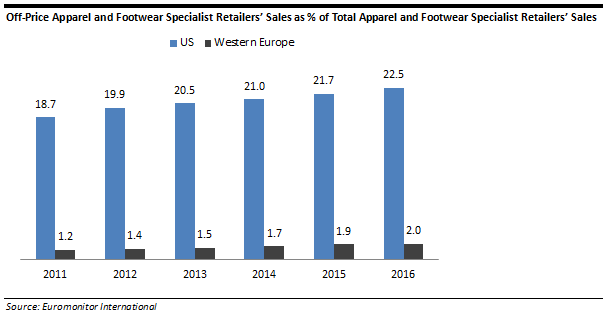 Some $232 billion of sales will flow through apparel and footwear specialist stores this year, according to Euromonitor. If off-price retailers can, in time, capture 5% of that sector, it implies the potential for almost $12 billion in annual sales, at 2017 prices. However, we think the off-price segment will achieve a lower penetration of the apparel sector in Europe than it has in the US. The relative strength of full-price retailing in Europe will likely make established retailers more reluctant to push into off-price formats there in the way that Nordstrom, Saks, Macy’s and Lord & Taylor have done in the US. Retailers’ wariness about possible cannibalization could cap the scale of the off-price sector in Europe. That, in turn, suggests that international entrants such as TK Maxx and Saks Off 5th could enjoy a free run to build share in the European apparel sector in the near term.